The man who became known the world over as ‘Satchmo’ was an ambassador for joy and happiness. His trumpet, his smile, his laugh and his willingness to ‘live for that audience’ all helped to make him a 20th century icon. He was also a trumpet player of outstanding skill whose technical expertise and the genius of his musical imagination made him the model for virtually every jazz musician from the late 1920s to the outbreak of World War 2 and beyond. As you would expect from someone who was recording for so long, Louis Armstrong has an enormous catalogue and it’s full of great music. Knowing where to start is the thing. For the best introduction to his long career check out Louis – The Best of Louis Armstrong or the 4CD set, Ambassador of Jazz which includes some recently discovered unreleased material and an hour long interview with Satchmo that is riveting. His albums with Ella Fitzgerald, Ella & Louis and Ella & Louis Again define what it is to perform a jazz duet. Equally, Louis Armstrong Meets Oscar Peterson is another exercise in brilliance. When Louis Armstrong was asked to define jazz he said. “Jazz is what I play for a living.” Few people have earned their living while giving so much to so many. His innate understanding of his instrument and how to combine his musicianship with his vocals, all topped off with his big personality, make him irresistible to millions of people around the world. 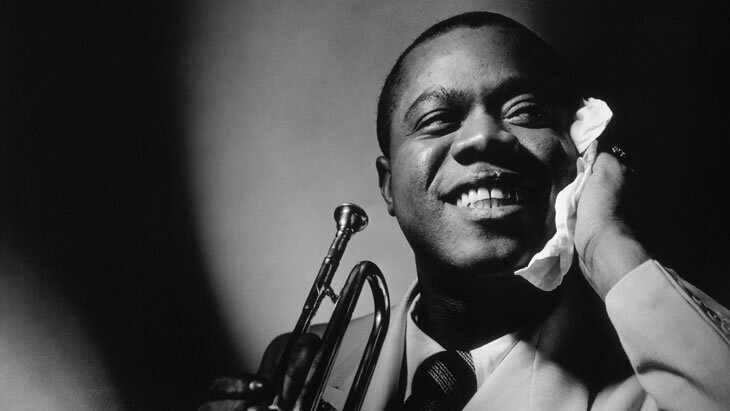 Louis Armstrong… Singer, Trumpet Player, Superstar.